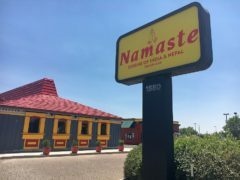 On June 20, 2018, Namaste Rio Rancho moved to a new location a few hundred yards to the east on Deborah. Same delicious food and smiling staff. I feel like a family member here, and have for the past ten years. 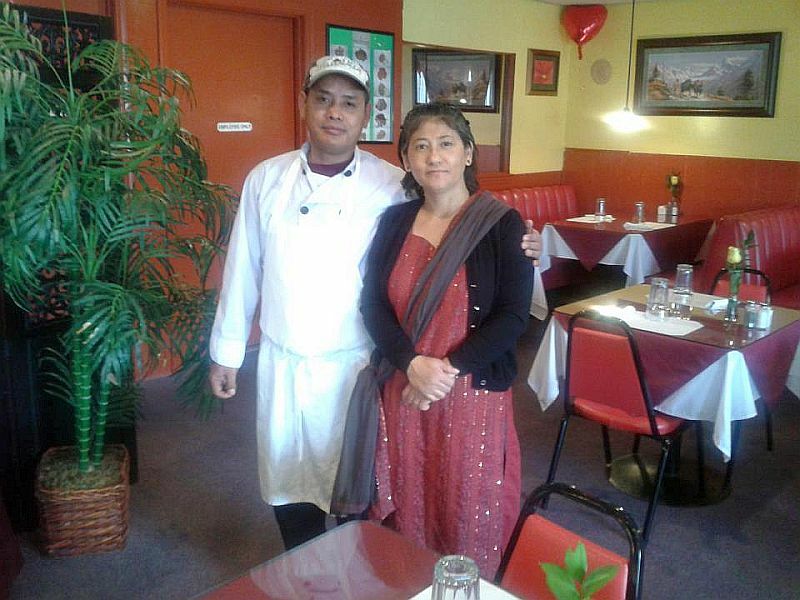 Namaste Cuisine of India and Nepal was started August 2008 by Shree Prasad Gurung, his charming wife, Sandhya, and hrother-in-law Hem. 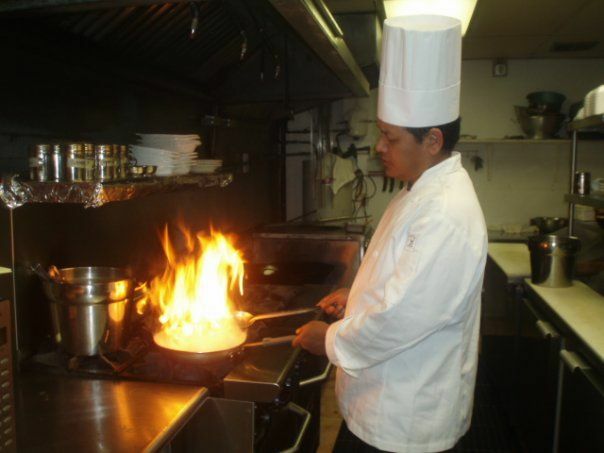 This family-run restaurant is the first Indian and Nepalese restaurant in the Duke City area. 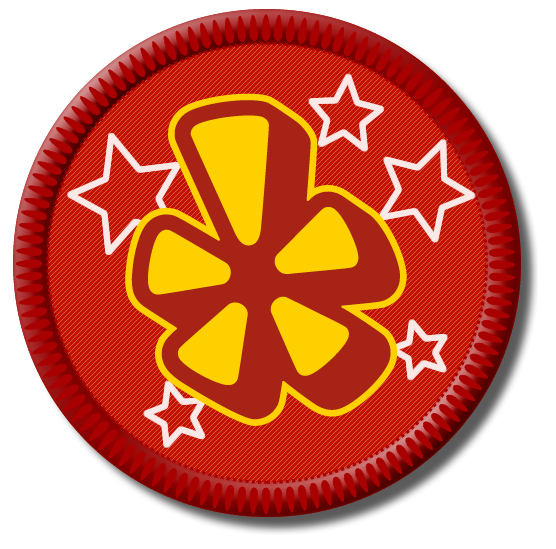 The room is quite lovely, the staff quite friendly, and the service is exemplary. But this is true of many Indian restaurants here. What sets Namaste apart from the pack is the food, and that’s why we go there. Aah, the food! The spicing is delicate and the sauces are complex — never over-the-top shouting at you, “I’m Indian, therefore cayenne-hot.” The balance is so close to being perfect that you can taste everything — amazing in this Enchanted Land of Chile. The menu is not so huge as to be overwhelming. But you will surely find your favorites here. Chicken, lamb or goat, seafood, biryanis, vegetables, and much more. Tandoori, korma, vindaloo, tikka masala, and more. Visiting sister had the Seekh Kabob (ground lamb, spiced, and cooked in the tandoori), which she declared first-rate. Jane had Saag Paneer (spinach and paneer cheese in a gentle creamy sauce), which we all declared among the very best we ever had. I ordered off-menu (as I often do) and asked Sandhya to see if the kitchen would prepare Fish Korma for me. White fish cubes prepared in a complex, cashew-laden white sauce. Simply perfect. [About a month after I had this dish, it appeared on an updated menu.] The basmati rice with peas was fine. The Nan was beautifully done. This quickly became one of our favorite restaurants. It’s just up the hill from where we live. Perfect Friday night place for us. You, too, maybe. 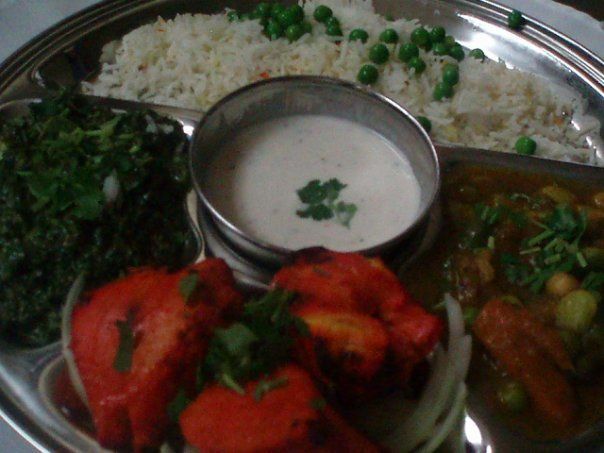 Tandoori Chicken, Meat Balls, Dal, Saag, two desserts, salad, fruits, chutney, raita, dressing, an appetizer, rice, naan are daily featured on the buffet, along with two other meat items are changed as given below on the day-by-day chart, and two vegetables are changed daily. 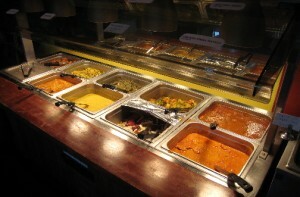 The buffet lunch is a fine way to sample many of the dishes on the regular dinner menu. Among my buffet favorites are Saag Paneer (perfect), Chicken Tikka Masala (with dark meat — my favorite way to prepare this dish), and the Meatballs, which are melt-in-your-mouth tender and as delicious as anything Indian you are likely to encounter in this city. But nothing’s perfect — the Tandoori Chicken was a tad too dry. Most buffets are but a mere shadow of the wizardry of the cooks. Not the case here, where each dish stands on its own merits. Never stale or lukewarm, each dish is carefully replenished as necessary. This is among the very best buffets of any kind that I have had anyplace, and outshines the regular menu in most other (and lesser) Indian restaurants. Bargain, too. Accompanied by Naan and Black Tea, it came to $10.14 including the Governor’s contribution. Around the same price as a Green Chile Cheeseburger with fries, but lots better tasting and better for your arteries. And waistline. On our latest visit, I decided to abandon my Fish Korma favorite for something very spicy. Green Chile Chicken Curry popped off the menu at me. 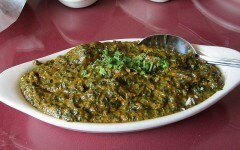 But I really wanted Lamb Saag, another of my favorites. Jane ordered her favorite, Saag Paneer, I ordered Lamb Saag, and we both decided to share a half-order of the chicken. 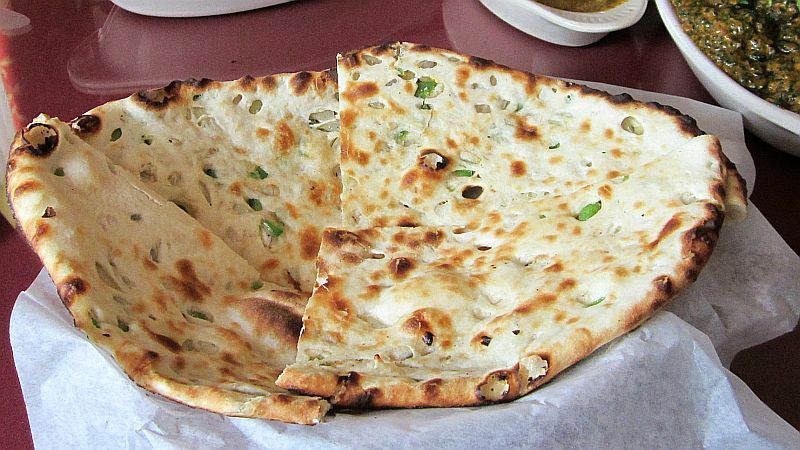 Onion Naan completed our choices. Thanks, Shree. You did it again. Anazing. I asked for this dish to be prepared very spicy (hot). 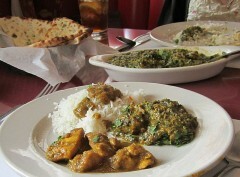 It was But like every other dish at Namaste, the heat never overshadows the other spices. Very tender and tasty cubes of lamb with an incredibly tasty and creamy saag, this dish has become my benchmark with which I shall judge any other Lamb Saag that I come across. Perfection. Phenomenal. Green Chile Chicken Curry, Basmati Rice, ans Lamb Saag. Onion Naan and Saag Paneer are toward the back. Jane’s Saag Paneer was, as usual, perfect. 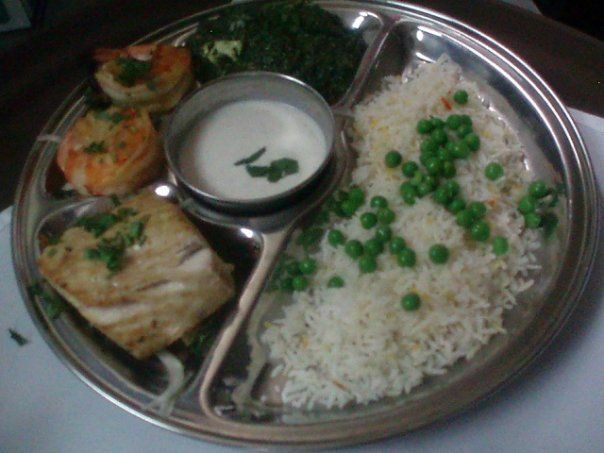 This has become her favorite Indian dish, and she uses the Namaste version as a benchmark. This was yet another perfect meal at Namaste. 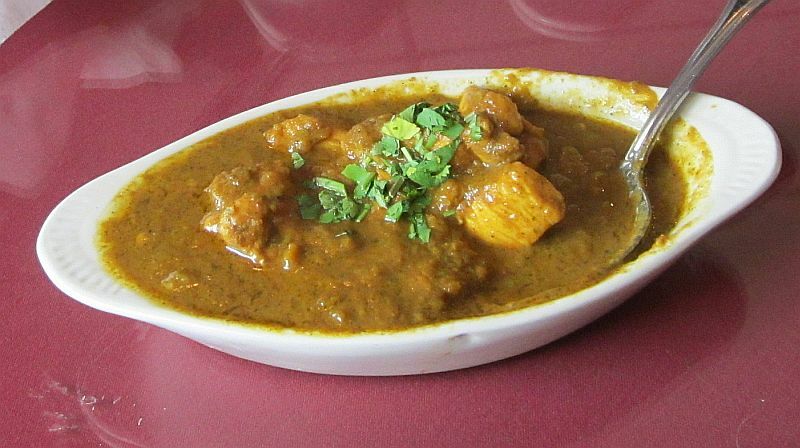 But why not — this is the best Indian restaurant in New Mexico. The real surprise of the evening was the chicken. Sandhya told me that it has become teir most popular dish. But of course. My only regret this evening is not ordering a full portion of that stupendous chicken. I’ll know better next tine. My friend Gil Garduño on his blog rates Namaste at 24, and especially likes Naan, Kasmiri Naan, Lamb Momo, Mix Grill Tandoori. 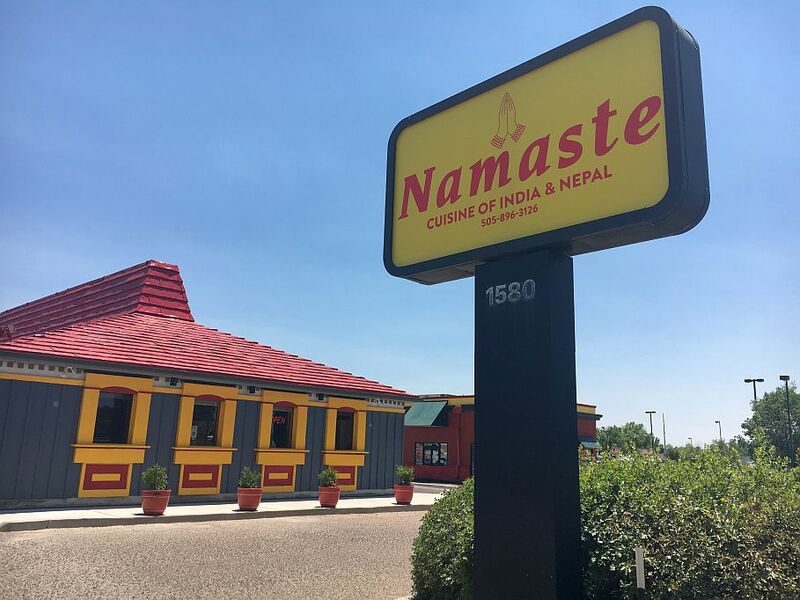 Sally and Andy Wasowski, hypercritical gastronomes, and our dear friends and dining companions from Taos, declared, raving, that Namaste serves the very best Indian food in the state. And who am I to disagree. I took them to Budai for lunch the next day, and it, too, blew them away, cementing in their minds my reputation as a best-of-breed picker. This entry was posted in Indian, Larry's Top Ten. Bookmark the permalink. 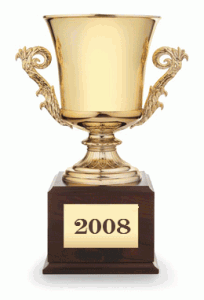 As two Brits who lived here in NM from 2006 to 2010 – and who are in town after a year away for a ten day vacation to catch up with friends and food – we can wholeheartedly reinforce your comments. 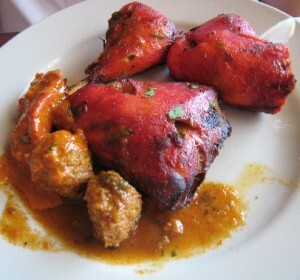 There are now more Indian restaurants in the UK than fish and chip shops and the number one selling carry out meal in Britain is chicken tikka massala (Not a lot of people know that!) – so we reckon we know a thing or two about authentic Indian food. When my partner and I arrived in town we had four places on our “Absolutely must visit” list – Namaste was No.1, followed by Blades Bistro (Placitas), the Pinon Cafe (also in Placitas) and Mary and Tito’s on 4th Street. We’ve done the lot, satisfied our craving for NM chile for another few months and have enjoyed the best Indian and European food in the State. Can’t wait to return. What makes Namaste so exceptional, apart from the simple goodness of Sandhi and her brother at front of house, is the ability of the kitchen to permit you to taste every spice on the plate, instead of simply being met with a melange of hotness. To recognise the coriander (cilantro in american) the cumin and all the other spices is a real achievement, only managed by the best. A wonderful enterprise which thoroughly deserves to succeed. I went here once. Someone recommended it and it was not good. Very friendly service but the food was below average. For Albuquerque I still think Taj Mahal blows every indian restaurant out of the water. In fact its better then any indian restaurant I’ve been to in LA and other major markets. I’ve yet found any somosa that came close to the ones taj mahal makes. The tantoor dishes, nans, lamb are so good at Taj Mahal. Save your money and avoid Namaste.